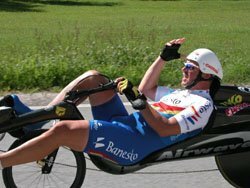 Helmut Lechner from Austria took the first place during the 10 kilometre time trial on the Austrian European Championships (19 - 22 August 2004). He covered the distance in just 9 minutes, 41.70 seconds, thus racing with an average of 61.89 km/h (standing start)! Lechner used an M5 Carbon Low Racer with tail fairing.